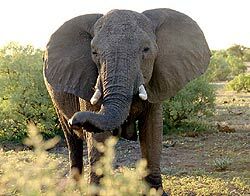 The elephant's nose and upper lip are elongated into a muscular, powerful trunk. This truly multi-purpose tool is powerful enough to uproot trees but dextrous enough that the two 'fingers' at its tip can pick up single seeds. Elephants can swim considerable distances and, in deeper water, will use their trunks like snorkels. The tusks are elongated upper incisor teeth and are not necessarily the same size. Some adults lack tusks and some have only one. Bulls typically have thicker, heavier tusks than females. Elephants will often uproot trees and then use their tusks to chisel the bark off. An elephant's eyes are small relative to the huge size of the animal. The ears are very large, flat and roughly the shape of the African continent, often with tears and holes in them. The ears are laden with blood vessels and when flapped, help bring down the huge beast's body temperature. The front feet are roughly circular, with five blunt toenails; the hind feet are oval, with four blunt toenails. The soles are padded, allowing amazingly silent movement for such a large amimal. The tail is thin, up to 1.5 m long, and has a whisk of long, thick hairs at the end. Females have one pair of mammae, low on the sides of the chest, just behind the forelegs. Both sexes have a thick flap of skin hanging between their hind legs. Males are larger, taller and twice as heavy as cows. Bulls have wider heads and in profile they have a more rounded forehead. Very unselective; when browsing acacias they swallow more wood than leaves. In summer, grass forms the bulk of the diet, replaced in winter by woody plants. Intake is about 150 kg wet weight per day while water intake is 120 litres a day for an adult bull. Single calves weighing 120kg are born throughout the year after a gestation of 22 months. Calves are weaned at 3-8 years, just before the birth of the next calf. Elephants are very vocal, producing a wide variety of squeals, screams and high-pitched trumpeting which are audible to humans. Seventy-five percent of the vocal communication uses frequencies too low for humans to hear. For additional information on elephants, see also African Elephant Biofile.